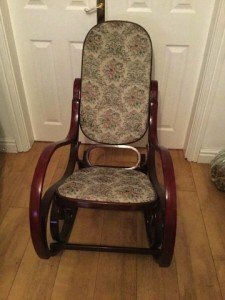 A vintage solid mahogany based rocking chair, upholstered to the back rest and seat in floral patterned fabric. 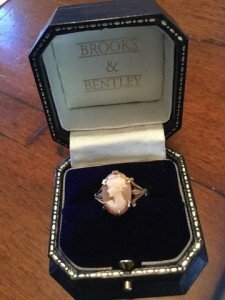 A vintage 9 carat gold cameo ring in a Brooks & Bentley jewellers box. 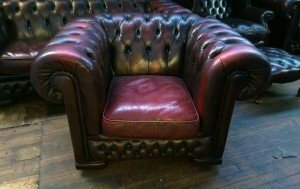 A small square backed Chesterfield gentleman’s club chair, upholstered in oxblood red leather with button detailing. 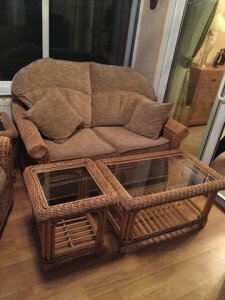 A five piece wicker conservatory suite, comprising a two seater high back sofa upholstered in stone cord, together with a matching armchair and three glass inlaid coffee tables. 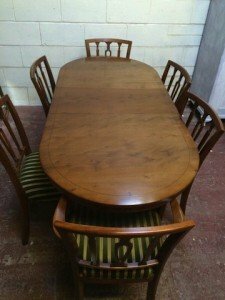 A vintage solid wood extendable oval dining table, together with six matching rounded back dining chairs, upholstered in striped green fabric. 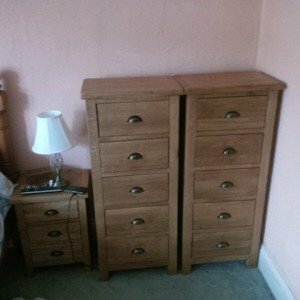 A matching pair of solid wood five drawer chests with chrome handles, together with a matching three drawer bedside table. 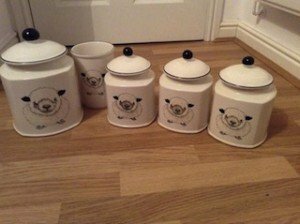 A collection ceramic kitchen canisters printed with sheep, comprising a utensil holder, a cookie jar and tea, coffee and sugar canisters. 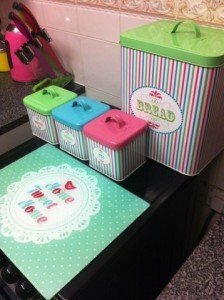 A collection of colourful kitchen accessories, to include a home sweet home chopping board, an acrylic knife block, a bread bin and tea, coffee and sugar canisters. 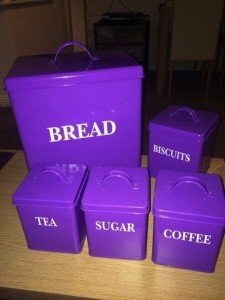 A collection of bridge purple metal kitchen canisters, to include a large bread bin, a biscuit tin and tea, coffee and sugar canisters. 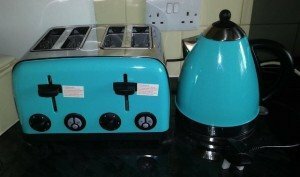 A Tiffany blue and black four slice toaster and matching 1.5 litre kettle. 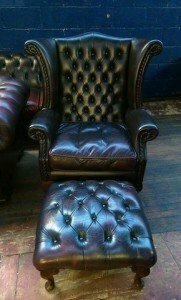 A vintage Chesterfield wing back gentleman’s club chair and matching footstool. 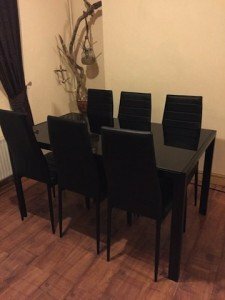 A large black glass and solid wood dining table, together with six matching high back black leather dining chairs. 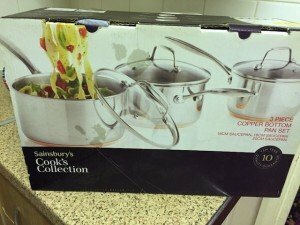 A brand new boxed Sainsbury’s cooks collection three piece copper bottom lidded saucepans. 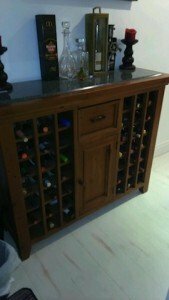 A solid wood marble toped wine storing unit, having one small draw above a cupboard to the centre and a wine rack to either side. 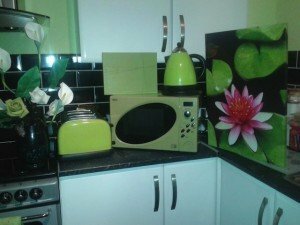 A large collection of green home accessories, to include a microwave, a kettle, a four slice toaster, a large canvas etc. 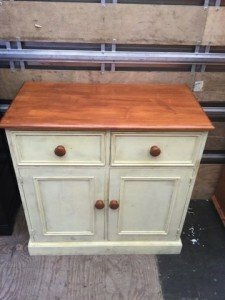 A hand painted white solid pine side unit, having two drawers above a double door cupboard. 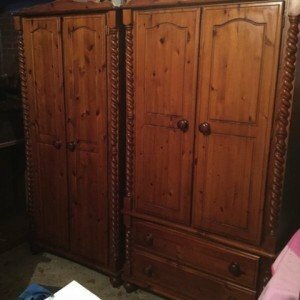 A near pair of solid pine double wardrobes, one with two doors, the other with two doors above two drawers. 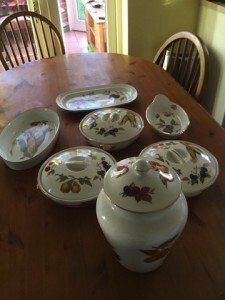 A collection of Royal Worcester kitchen accessories from the Evsham collection, including a lidded ginger jar, three lidded casserole dishes and three other dishes. 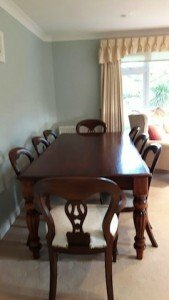 A vintage mahogany dining table on carved legs, together with eight matching low back dining chairs. 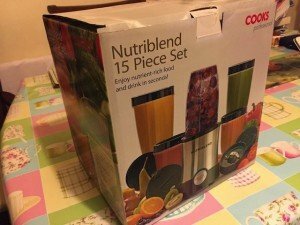 A brand new boxed Cooks professional Nutriblend 15 piece stainless steel blender.